We’re headed into the middle of summer and we thought it was the perfect time for a reminder about how easy it is to stay safe and healthy this summer. Doctors have been talking about sun safety for years and with melanoma on the rise, protecting ourselves from the harmful effects of the sun is more important now than ever before. According to the Canadian Cancer Society, this year 7,200 Canadians will be diagnosed with melanoma skin cancer. It is one of the fastest-rising of all cancers and also one of the easiest to prevent. There are a number of ways to help avoid becoming a statistic such as, covering up, staying in the shade and applying sunscreen (with an SPF of 15 or higher). Our Live Well with Osler series has six helpful tips on how you can practice safe sun. In true Canadian fashion, warm summer weather has inspired many of us to enjoy the great outdoors by visiting local parks, exploring hiking trails and heading out on a camping adventure. You may have seen news reports (one example here) about the rise in the number of ticks in Southern Ontario. Ticks are carriers of Lyme disease, a bacterial infection caused by tick bites. While the risk remains low, it’s important to safeguard against tick bites by covering up exposed skin and checking yourself for these travellers after spending a day outdoors. Check out our recent post on Facebook to learn more about how you can avoid tick bites this summer. No matter how careful we are, there are times when we need medical care. Clinics in the community often have holiday hours in the summer and knowing your options when your primary health care provider is unavailable is a great way to get prepared for any situation. The UCC is open from 8 a.m. to 10 p.m. every day and you don’t need a referral or appointment. If you experience severe chest pain, stroke symptoms, or you are uncertain, always call 9-1-1 or go to the nearest Emergency Department. Summer is only half over and we hope you take these tips to heart as you enjoy the next few weeks. Being recognized by one’s peers is one of the most honoured achievements a person can receive. Each year we present health care professionals with peer-nominated Awards of Excellence as one of the many ways we acknowledge exemplary clinical work by individual health professionals, physicians and clinical teams. Because nominations come directly from colleagues, these awards feel extra special and this year an unprecedented 108 staff received nominations. Last year, we revamped our recognition program to make it more inclusive of our clinical teams and to highlight the collaborative relationships and partnerships that exist between our clinical teams. This combined recognition is celebrated in addition to the individual professional practices. I, along with members of Osler’s Senior Leadership Team, were honoured last week to present the awards in ceremonies at Brampton Civic and Etobicoke General, with a live telecast at Peel Memorial, to ensure our nominees and winners are able to celebrate these accomplishments with their colleagues. The enthusiasm for our recognition program speaks to the amazing work that takes place among our teams at Osler. Every summer a record or two is shattered in the Greater Toronto Area. It could be a weather record, an attendance record, or in the case of Osler Foundation, a fundraising record. Earlier this summer I wrote about the exciting events happening in support of Osler Foundation and we’ve kicked it off in true Osler style. We weren’t kidding when we said we had teed up an exciting day on the links. The Osler Open: Brampton Invitational, presented by DG Group, brought out 200 golfers to raise $312,000 to equip the new Peel Memorial and fund the next generation of diagnostic equipment and technology at Brampton Civic. This annual event is always a big draw. Her Worship Linda Jeffery, Mayor of Brampton, was in attendance as were a host of other dignitaries including the Chair of the Regional Municipality of Peel Police Services Board, as well as city and regional councillors. It was heartening to see members of the community, as well as community leaders, driving home their support for high-quality health care close to home. Check out the photo gallery if you missed out on the fun! Presented by Whole Health Pharmacy Partners, the third annual Osler Walk ’n Roll Fest for Healthy Kids saw hundreds of participants from across Etobicoke walk and wheel their way around the 5K route at Woodbine Racetrack to raise vital funds for children’s health programs at Etobicoke General Hospital. The annual event reached a new fundraising milestone, which is expected to top $105,000, a total that will be matched by the $15 Million Matching Challenge to bring us to a total of $210,000! All funds raised will go towards equipping the new NICU and expanded Labour and Delivery Unit in Etobicoke General’s new patient tower – which is currently under construction. Each year the Walk ‘n Roll gets bigger and better. At the finish line, walkers and rollers were greeted by a healthy lunch and a family friendly festival that included bounce houses, face painting, a petting zoo and games. If you missed out on the fun, check out the photo gallery from the big event! We will say goodbye to summer with our annual Osler Open: Etobicoke Invitational at the Lambton Golf & Country Club on September 18. This event is sure to sell out so register now to guarantee you can tee-off with your “fore-some.” Proceeds from the tournament will help support the development of the new four-storey patient tower at Etobicoke General. Osler has always relied on the generosity of the community to equip our spaces and help fund our redevelopment projects. Thank you for your ongoing support of Osler Foundation – we couldn’t to what we do without you! 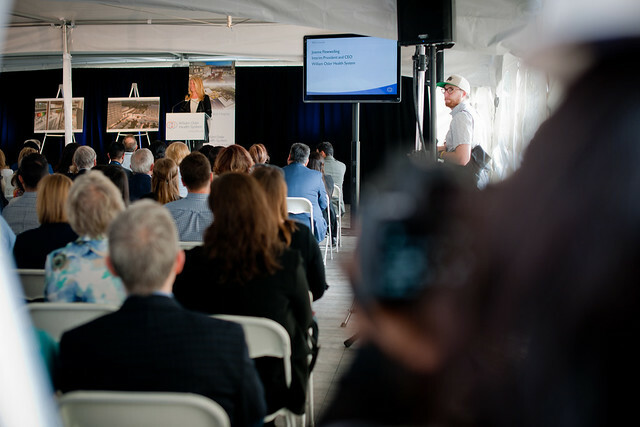 It’s hard to believe that just one year ago we gathered at Etobicoke General Hospital to break ground on the new four-storey patient tower and Ancillary Services Building (ASB). So much has been achieved in such a short period of time and now we’ve reached an exciting milestone! 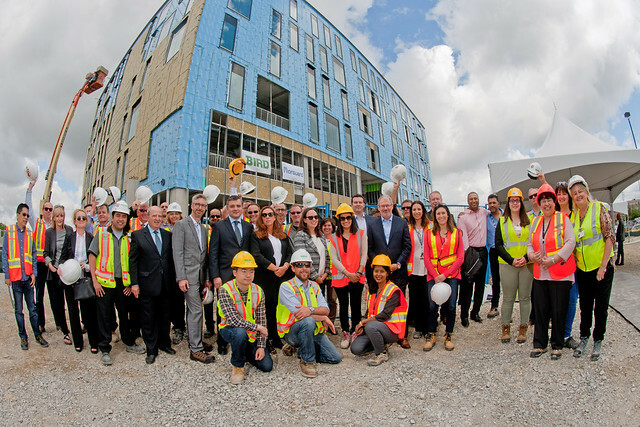 On June 26, we welcomed members of the Osler community – dignitaries, health care and business leaders, construction partners, donors, local residents and our incredible staff, physicians and volunteers – to the site for a standing room only event to celebrate the “topping off” milestone. “Topping off” is an event that is widely recognized in the construction industry that signifies that the building has reached its full height and that the structure of the building has been completed. Following the formal portion of the event, guests were invited to sign a beam that will be installed as part of the new patient tower and steel plates that will become part of the ASB. In case you missed it, check out our photo album from the event on Facebook! When it opens in 2018, Etobicoke General’s new patient tower will add 250,000 square feet of space for new and expanded departments, including a state-of-the-art emergency department that will greatly improve access to care and patient flow. The ASB will replace the aging, existing medical office building with more than twice the square footage of contemporary medical space that will house existing ambulatory care clinics and a new satellite dialysis program. There is plenty of work still to be done before we can officially open our doors to patients, but this is a remarkable step in our redevelopment journey!